In January 1920, Stan McVittie was a fit and robust electrical engineer working at a hydro-electric generating plant on the Wahnapitae River in Northern Ontario. Just six years out of university, he loved his work and the outdoor life he’d known all his life. The future was brilliant. 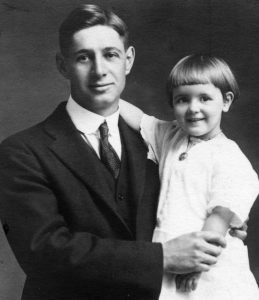 Stan McVittie, Sudbury, Ontario with daughter, Maggie – undated Circa 1919 Private Collection, Blake Heathcote, Toronto. While his young wife and daughter were visiting her parents in St. Marys, Stan developed a mild cough and a fever, but nothing to worry about for a healthy 6’ 2” outdoorsman in his prime. A few days later while visiting his father and sister in Sudbury, his symptoms worsened slightly, so he paid a call on the family doctor ‘just to be safe.’ Nine days later Stan was dead from the Spanish Flu, like 50,000 other Canadians who’d died since the Pandemic first appeared eighteen months earlier. national commemorative project add to the existing scholarship about the Flu? Who is the target audience for a ‘Flu’ commemoration? Indeed, why bother? In the year after the popularity and intrigue triggered by the 100th Anniversary commemorations of the Battle at Vimy Ridge, designing a project that illuminates the enormous impact of the Flu Pandemic on Canada’s history runs to the opposite end of the spectrum of ‘memory tourism.’ And perhaps more importantly, challenges us to reconsider what a 21st commemorative project looks like. Stories that such statistics tell are seemingly endless. problem, not an individual one. Isn’t this a story our students should know? written for the Canadian Century Digital Scrapbook series. 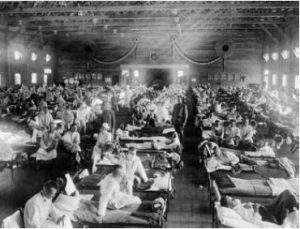 The global scope of the Pandemic has been investigated with precision by Laura Spinney in her 2017 publication, Pale Rider: The Spanish Flu of 1918 and How It Changed the World, and there are many other papers and dissertations across Canada that position the Flu Pandemic in its historical context. and region. Unknown stories, such as Stan McVittie’s, represent a ‘micro-history’ of our country. Canada to commemorate the 100th Anniversary of the Spanish Flu Pandemic. Canada (LAC), ActiveHistory.ca, Huron University College, and dozens of Canadian school boards, organizations, and institutions, Testaments.ca will launch our ‘Digital Commons’ platform. This will provide a nationwide forum for students in Arts, History, or Science classes to create and share commemorative projects and content, featuring local and regional stories about the Pandemic. Indigenous, immigrant, rural, as well as urban settings. These are ‘Flu-stories’ that need to be told. empower them in their explorations researching history, language arts, and social studies. Pandemic from the perspective of that person or event. Specifically, the students construct or ‘tell’ a story from that singular personal perspective as a means of coming to better understand the Pandemic, and to bring a large subject into focus through a more intimate, human lens. A major feature of the DHP is our ‘7 Sentence Storytelling Guide’, which introduces students (in any discipline) to the principles of structured narrative. On our website, we will provide downloadable learning materials, assets, templates, online tutorials, and digital research inquiry lessons to guide them every step of the way. When complete, their stories are presented in any digital medium (eBooks, websites, videos, interactive displays, exhibits), and shared on Testaments.ca’s ‘Digital Commons ’ – the term Testaments.ca uses for its shared meeting space for students and researchers on the Platform. Combining the strengths and skills of digital research, storytelling, independent study, and multi-disciplinary thinking, the DHP offers schools and museums across the country an exemplary template for conducting digital research with students in virtually any subject discipline. For example, with history teachers it encourages the integration of data management principles into historical inquiry classwork. Statistical evidence thereby becomes a significant factor in guiding student learning. primary documents to build the ‘digital assets’ needed for the Testaments.ca Platform. Platform, then reach out to us! major challenge, one which Testaments.ca argues is well-addressed by the DHP. 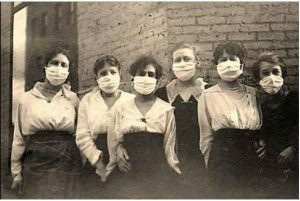 The commemoration of the 100th Anniversary of the Spanish Flu Pandemic in your program will engage your students in rich historical inquiry, and establish connections for them that extend far beyond the classroom. You can display your students’ work for an audience across the country on the DHP’s Digital Commons, and ‘crowd-share’ the Canadian stories that have impacted and shaped our history. This commemorative project will make you and your students a significant part of our national heritage. Tell 12,000+ Canadian Spanish Flu stories over the next 24 months.